This week the City Council will again meet twice: tonight for a continuation of the last few weeks’ ongoing discussions on the 2017 budget, and on Wednesday night for a regular Council meeting, which will also include public hearings on the budget and on our local property tax rate for the coming year. I encourage residents to attend the public hearings on Wednesday to offer opinions on our municipal budget and tax rate. Tonight’s meeting, which starts at 7:30 PM, will not involve any votes. The entire meeting will be focused on discussion of the Departmental and Non-Departmental Budget, and on Budget Reconciliation (the latter term refers to potential ideas that may be put forward by Councilmembers, that are not in the current proposed budget). Wednesday’s meeting (https://documents.takomaparkmd.gov/government/city-council/agendas/2016/x2016-04-27-council-agenda-for-posting.pdf) will include an initial vote on the cable franchise agreement with Comcast; a vote on additional design funding for the Flower Avenue Green Street project; a vote on a contract to update our street pavement condition study; a vote on closing a portion of Grant Avenue for the Grant Avenue Market on May 8; a discussion of the proposed ordinance banning most commercial use of single-use plastic bags; and a discussion of the Takoma Junction Redevelopment Process Committee. While the public portion of the April 27 meeting will begin at 7:30 PM, we will meet in closed session starting at 6:00 PM to discuss the City Attorney’s evaluation. Below are my thoughts about the various agenda items. More detailed background can be found in the links. Constant Yield Tax Rate Public Hearing (https://documents.takomaparkmd.gov/government/city-council/agendas/2016/council-20160427-1.pdf) and Budget Public Hearing (https://documents.takomaparkmd.gov/government/city-council/agendas/2016/council-20160427-2.pdf). The City Manager has proposed that the current City tax rate ($0.585 per $100 of the assessed value of property) be maintained for the coming year. The City is required under law to hold a hearing on the Constant Yield Tax Rate, which is the rate that would ensure that approximately the same overall amount of revenue is raised in the coming year as in the current year. In this case, because on average the assessed value of properties in Takoma Park has increased (as calculated by the State of Maryland), the Constant Yield Rate is slightly lower: $0.5518 per $100 of assessed value. Our deliberations in the Council have been centered around setting the tax rate for the coming year at or between either of those two rates. What do these rates represent? For a home with an assessed value of $500,000, the Constant Yield Rate would result in a City tax bill of $2,759, while keeping the current tax rate would mean a $2,925 tax bill. Note that this is only the City tax rate – it does not include the total amount that appears on residents’ property tax bills, which is a larger number that also includes the County property tax. The annualized difference between these two amounts is $166, or about $14 per month. Properties valued at more or less than $500,000 would see a correspondingly higher or lower number at each of the two rates. The overall difference for the City between the two rates is estimated to be $697,644. In other words, if the Council were to approve the Constant Yield Rate for the coming year, we would have approximately $697,000 less funding available for the 2017 budget than we would have if we were to retain the current rate. My goal is to do what I can to push for a tax level closer to the Constant Yield Rate, while ensuring that we are able to both maintain our current level of municipal services and move forward in several key priority areas (including affordable housing, youth programming, community policing, and environmental sustainability). As I have mentioned in previous communications, it may be possible to achieve that goal through a combination of bonding for capital projects like the Flower Avenue Green Street, and holding off on initiatives like the proposed new environmental code enforcement officer, and the residents survey. It’s still too soon to know where we will end up, but it will be very valuable as part of our deliberations to have as much input as possible from residents, so again I encourage everyone to attend and speak up at the public hearings. Comcast Franchise Agreement. https://documents.takomaparkmd.gov/government/city-council/agendas/2016/council-20160427-3.pdf. 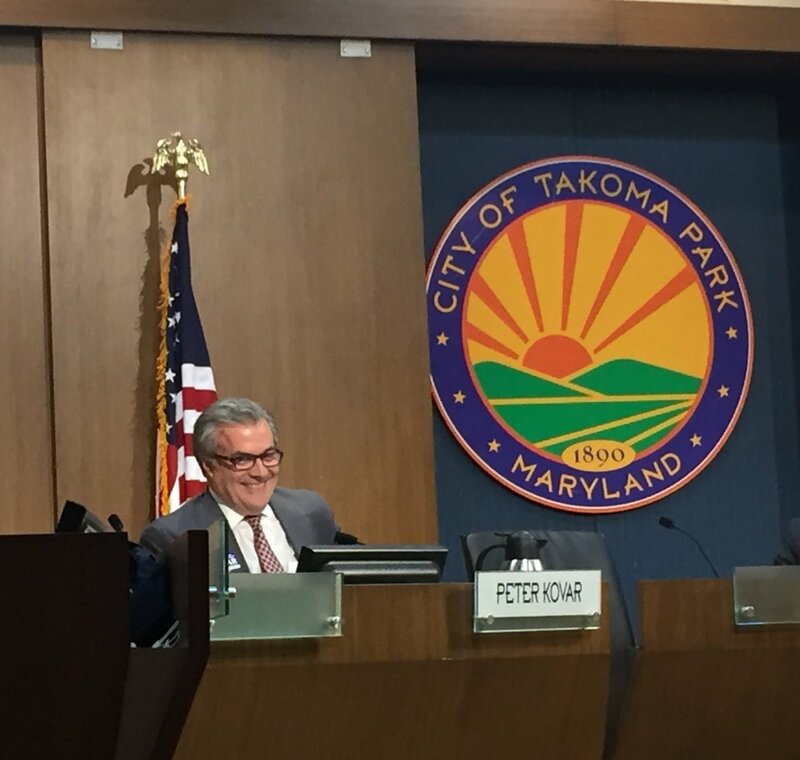 Takoma Park has contracts, negotiated primarily by Montgomery County, with 3 cable companies. The Comcast contract is due for renewal. As noted previously, I am interested in exploring whether we can use some of the reserve funds we have accrued under the existing cable contracts (which cannot be switched over and used for other non-cable related budget items) to improve electronic connections in the community, especially for lower income residents. Flower Avenue Green Street Design Funding. https://documents.takomaparkmd.gov/government/city-council/agendas/2016/council-20160427-4.pdf. I am a supporter of this project. These funds (a little under $75,000) are for the purpose of completing the design work. Pavement Condition Update Contract. https://documents.takomaparkmd.gov/government/city-council/agendas/2016/council-20160427-5.pdf. This is a $26,500 contract for assessing the condition of City streets in order to determine when they need to be re-paved. I anticipate supporting this contract, but I do have some questions relating to the timing in the past of re-paving projects (since I have seen some cases when it appeared repaving occurred earlier than I would have thought necessary). Grant Avenue Market Street Closure. https://documents.takomaparkmd.gov/government/city-council/agendas/2016/council-20160427-6.pdf. This is for a one-time closure for the fourth annual Grant Street Market on May 8. I will be voting in favor of it. Plastic Bag Ordinance. https://documents.takomaparkmd.gov/government/city-council/agendas/2016/council-20160427-7.pdf. As noted previously, I have some questions about how much we gain from the proposed ban, taking into account the existing fee for plastic bag use in Montgomery County and the exemptions in the proposed ordinance. In addition, considering the possibility that the proposed new environmental enforcement position may not be approved as part of the budget (as discussed above), we need to decide if we want to put in place a new environmental regulation with uncertain enforcement. This is a discussion only, with no vote taking place at this Council meeting. Takoma Junction Committee. https://documents.takomaparkmd.gov/government/city-council/agendas/2016/council-20160427-8.pdf. This is a committee recommended by NDC, the chosen developer for the Takoma Junction project. The committee would not have a policy advisory role, but rather would be focused on helping ensure that there is an appropriate level of outreach to the community about the project. That’s a laudable goal, though at this point I think the highest priority is moving forward on the Development Agreement with NDC, and making sure that the negotiations between NDC and the Co-op bear fruit. The key question for me is whether we should move forward on the committee prior to more progress being made on those two fronts. This is a discussion only, with no vote scheduled, so I look forward to talking about that point. As always, please feel free to be in touch with any questions or comments.